Although it is the most active volcano on earth, many visitors to Hawaii Volcanoes National Park standing on the very summit of Kilauea Volcano often stare and wonder “Where’s the volcano?” Nestled snugly up against Mauna Loa, and not as vertically spectacular as either this near neighbor or Mauna Kea, Kilauea doesn’t even appear to be a bump on the landscape from the usual viewpoints. Even though it doesn’t standout visually, Kilauea is one of the most intriguing and fascinating volcanoes on earth…let’s just take a quick look at some of the reasons why. 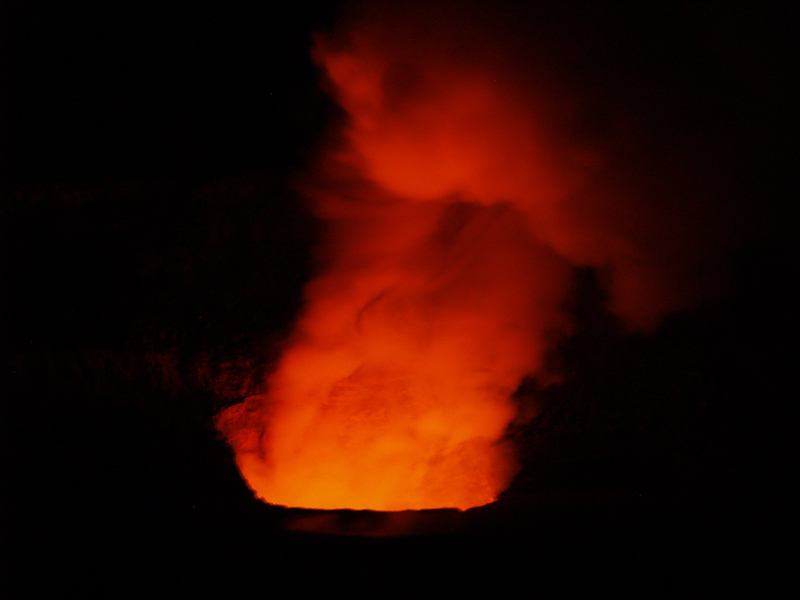 Comprising the entire southeastern portion of Hawaii Island, Kilauea Volcano is not only currently the world’s most active volcano, it is also the home of the fire-goddess Pele. 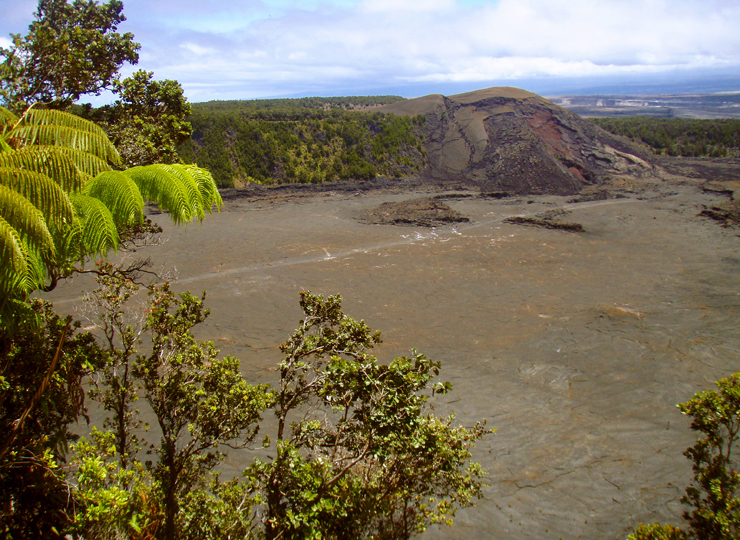 Early geologists believed Kilauea was merely a satellite vent of Mauna Loa, as it lies directly on that mountain’s southern slopes. 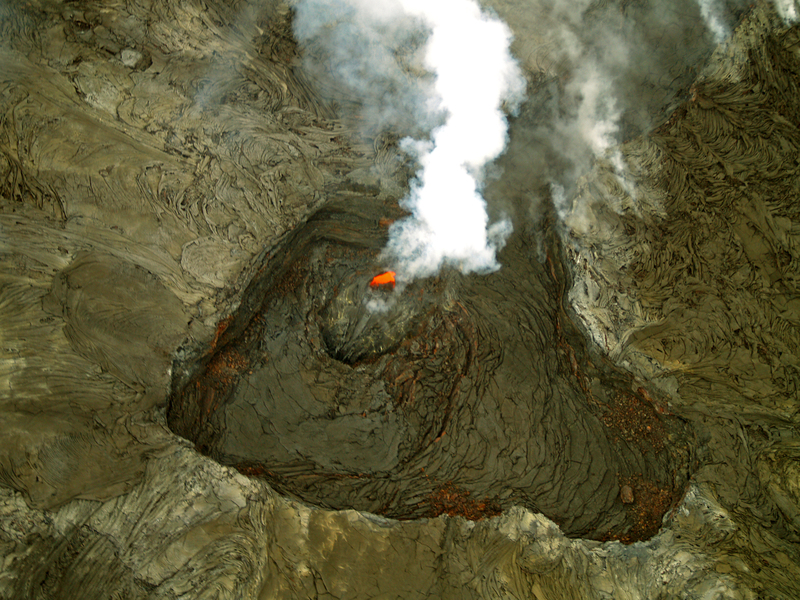 However, Kilauea is now recognized as its own, distinct, volcano which has its own, separate, magma source and unique plumbing. Presenting the classic “Hawaiian Shield Volcano” shape, a basic oval with low, shallow slope angles, volume-wise Kilauea is one of the the world’s most massive mountains. Standing 1240 meters (4080) above sea level, the above-ocean part of the volcano is about 80 km (50 miles) long and 32 km, (20 miles) wide, along an axis trending roughly southwest to northeast. However, like all the other Hawaiian volcanoes, the great majority of its vast bulk lies below the sea, about 5.5 km (18,000 feet) deep here, making Kilauea’s true base-to-summit height about 7 km (23,000 ft). Sometimes vying with Mts. Aetna and Stromboli for the title of “most active volcano on earth”, Kilauea has been erupting continuously since January 1983; between then and June 2009, nearly 700 acres of new land was created on Hawaii Island by Kilauea lava flows. 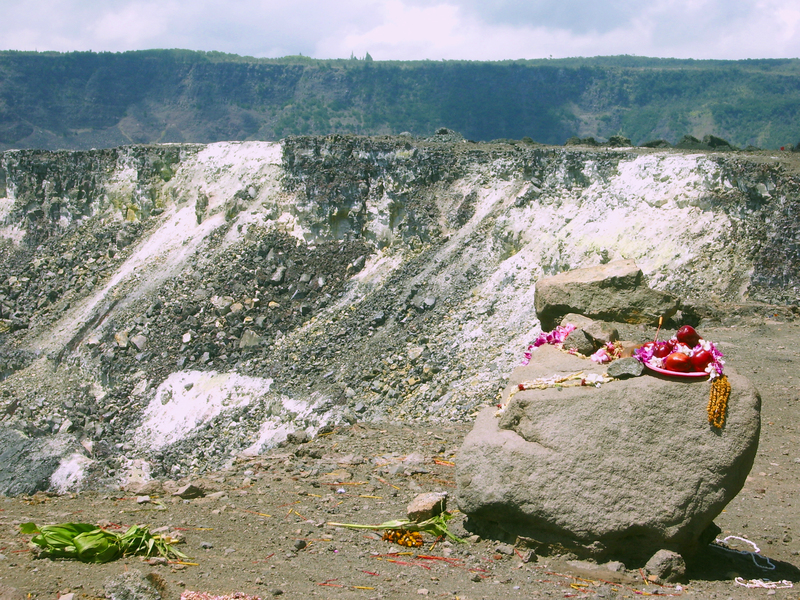 As the time scale of human lives and human tragedy are so much shorter than geologic time scales, and thus human memories of past disasters grow dim rather rapidly, this volcanic growth has come at quite a cost because people insist on building villages, towns and roads on this highly active landscape. In recent decades, the towns of Kapoho (in 1960), Kalapana (in 1990), and Kaimu (in 1990) have all been burned, buried and destroyed by Kilauea, and now are seemingly all but abandoned except by a few hardy souls. 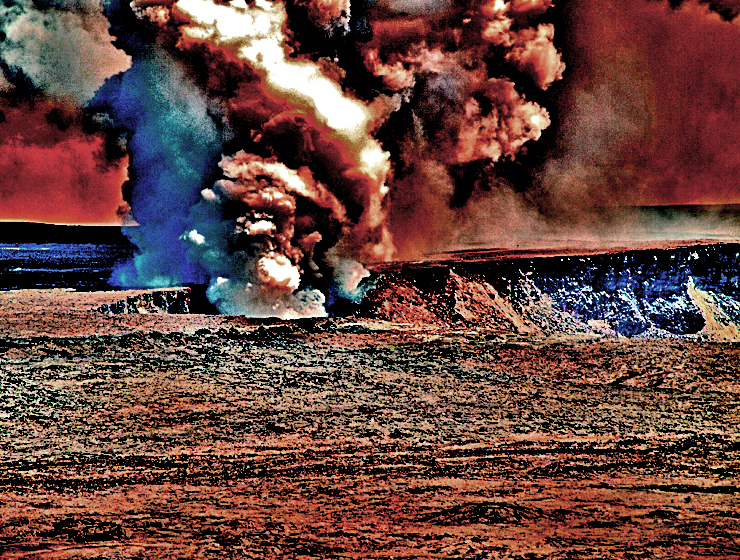 Although popularly thought to be rather tame with fairly peaceable eruptions, Kilauea in the past has had its fair share of explosive, violent, phreatomagmatic eruptions, spewing great quantities of ash as well. 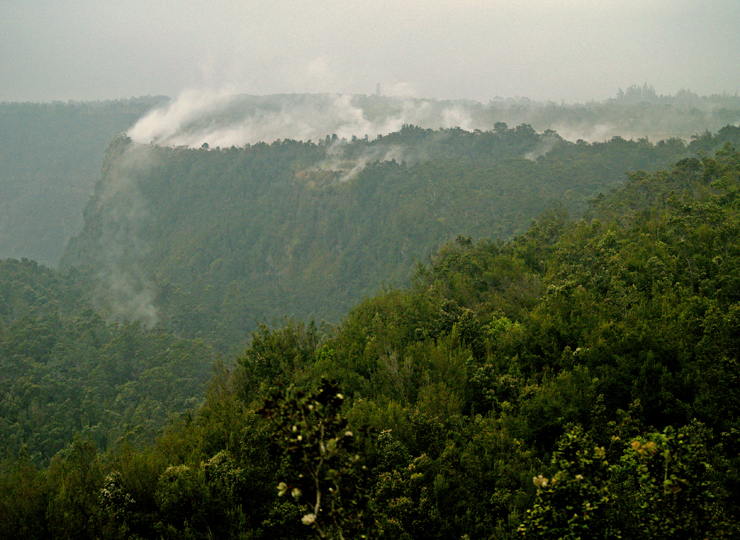 Kilauea owes its peculiar shape to two long rift systems, the currently active East Rift and the Southwest Rift. These rifts are comprised of huge, deep fractures through the bulk of the mountain. Magma rises from deep below the volcano to a pool just below the summit caldera, then flows through internal plumbing down either rift, causing flank eruptions at vents down-rift. 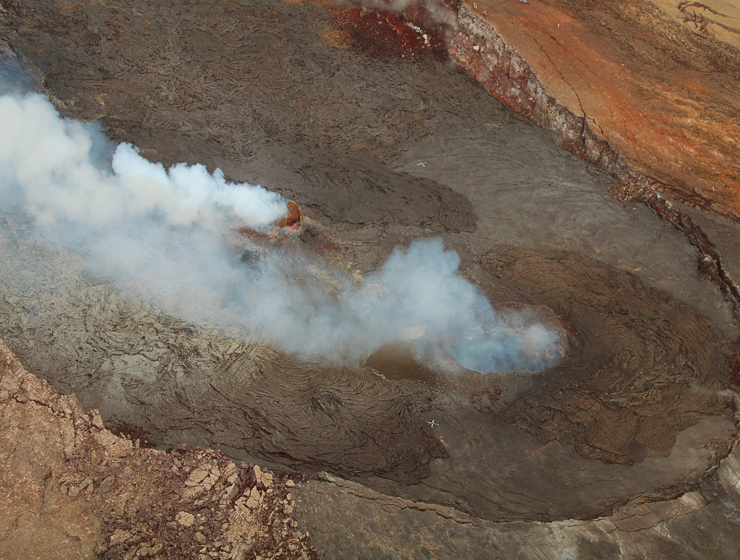 These flank eruptions greatly enhance Kilauea’s exaggerated elongate shape. In recent times, many more eruptions have occurred along the East Rift, than the Southwest Rift. 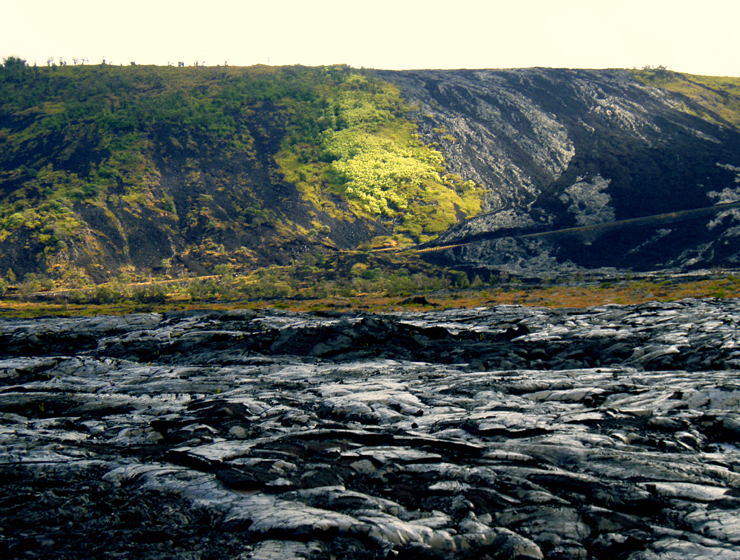 The orientation of these rifts is controlled by the geography of Mauna Loa and Kilauea, as well as by gravity. Because the north side of Kilauea is well buttressed by the huge mass of Mauna Loa and the unsupported south side slopes-off into the sea, the very mass of Kilauea is pulling it down slope, into the sea. 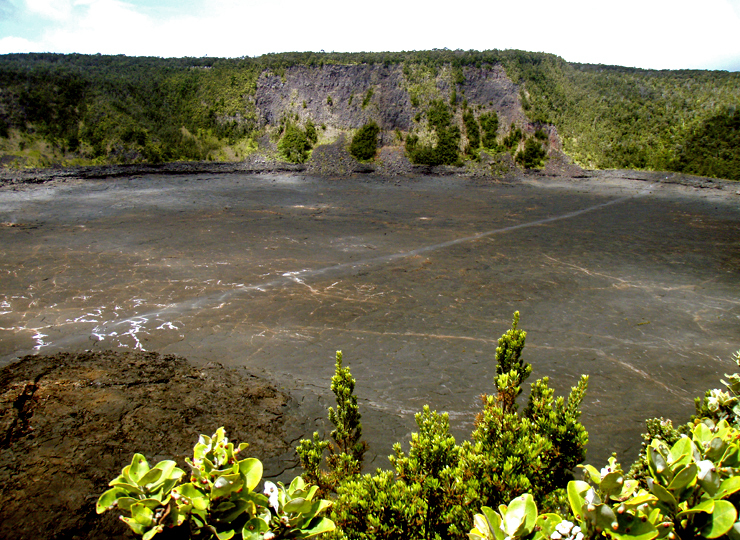 Indeed, the sub-sea, southern slope of Kilauea is a vast, hummocky field of debris from enormous landslides. Above sea level, this slumping activity is evidenced by the several, sub-parallel ridges (or “Pali”, in Hawaiian) on the southern flank. With throws of much as 430 meters (1400 feet), these faults represent the massive fracturing of the volcano’s southern flank and the subsequent slumping of these giant blocks down slope. A drive down the Holei Pali along Chain of Craters Road will quickly demonstrate the magnitude of seaward movement as Kilauea erupts, slumps and grows. Seaward slumping is exacerbated by the volcanic activity itself; as Kilauea fills with magma, it swells and slumps southward, producing massive earthquakes and landslides. The slumping, however, also exacerbates the volcanic activity. By opening-up new voids in Kilauea’s internal plumbing, the slumping allows injection of even more magmatic material into Kilauea, which then causes more earthquakes and more slumping. 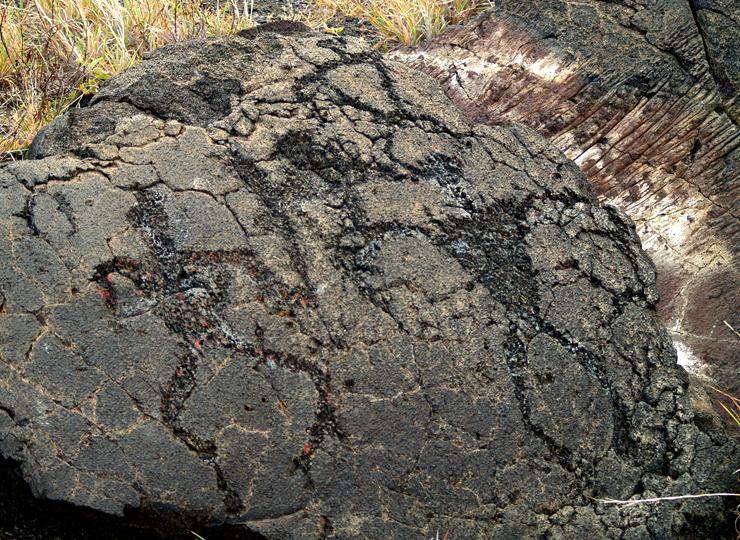 Essentially spreading under its own enormous weight, the synergy between magma injection and slumping allows Kilauea to grow both by eruption of, and intrusion of, magma. The supply of magma to the volcano is fairly consistent at 1.8 cubic km (1.0 cubic miles) per year, however forty to fifty per cent of the melt never makes its way to the surface. 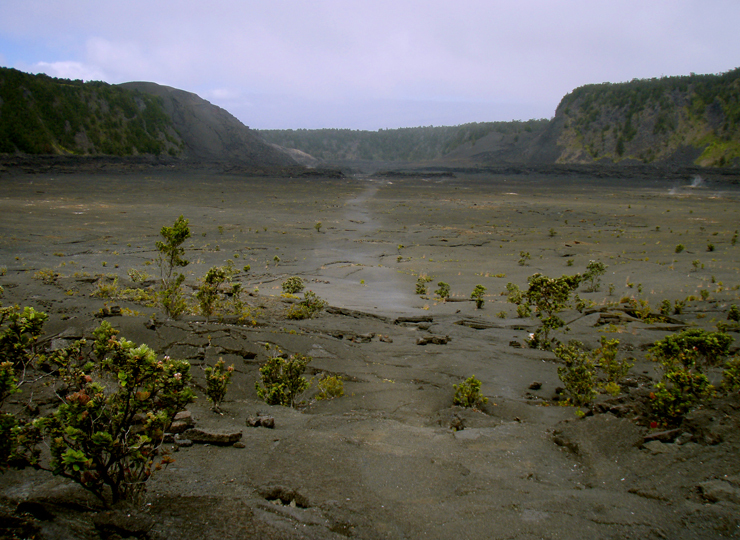 Called “endogenous growth”, nearly half the growth of Kilauea can be attributed to magma cooling and solidifying below ground, in the growing voids opened by the synergistic magma injection and seaward slumping of the mountain. 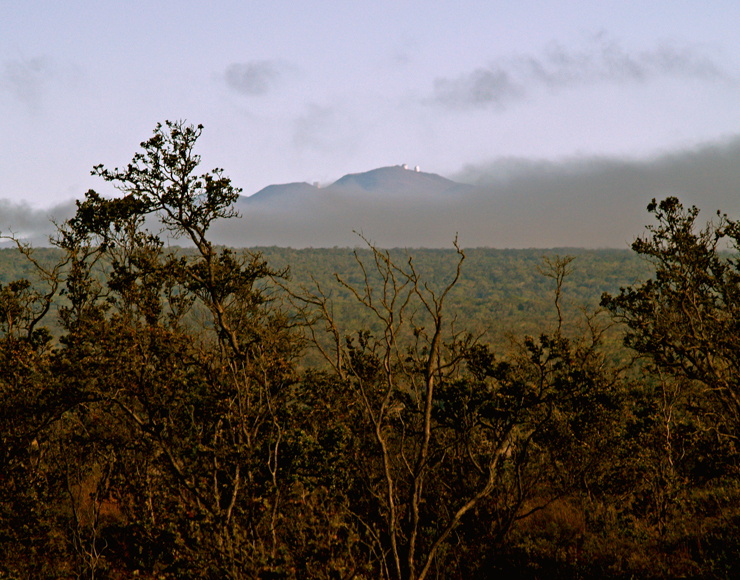 Conjoined on its northern flank by the vastly larger Mauna Loa, Kilauea doesn’t appear to the casual observer to have a true summit. 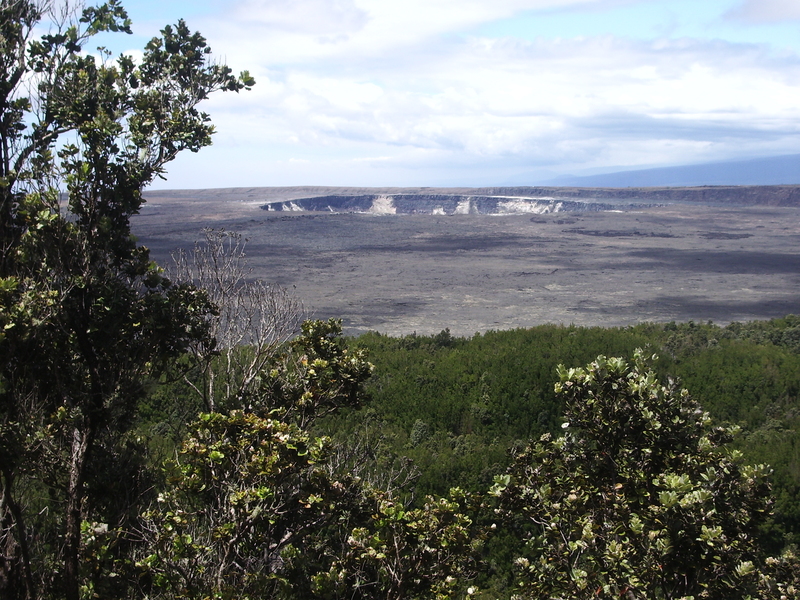 However, the summit region, around which Crater Rim Drive circles, is comprised of a larger collapse crater (Kilauea Caldera), which contains three smaller collapse craters (Halema’uma’u, Keanakako’i and Kilauea Iki Craters). Collapse craters, such as here and those along Chain of Craters Road, are formed when magma is withdrawn from a reservoir during an eruption, and the suddenly unsupported land above simply collapses into the void. As you look out over the enormous cavity formed by Kilauea Caldera, imagine the immensity of the eruptive event that left enough of a void in the magma chamber to allow this huge crater to form. 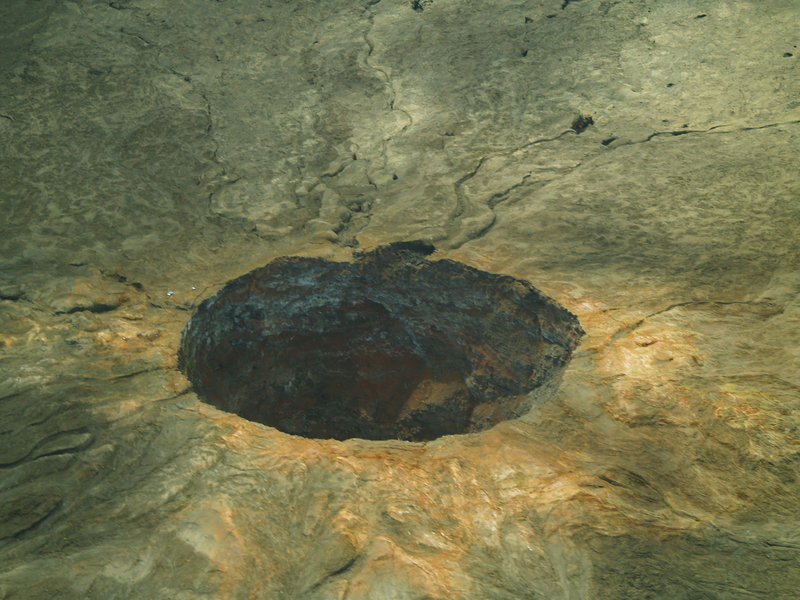 Kilauea’s large magma pool lies just below the summit region, somewhat south of Halema’uma’u Crater, at a depth of about 1.5-5 km (1-3 miles). Forming a magma reservoir several kilometers wide, it acts as central storage for the entire summit-rift magma plumbing system. Partial melting in the mantle at a depth of 40-60 km (52-30 miles) produces magma which rises through the earth and pools within a couple kilometers or so of the surface, and which then flows almost immediately to the site of eruption (summit or flank), having very little residence time within the volcano itself. This “open door to the mantle” feature is a fairly unique to Kilauea Volcano. Based on eruptive patterns in recorded history, Kilauea has been observed to follow three shifting modes of eruptive behavior. 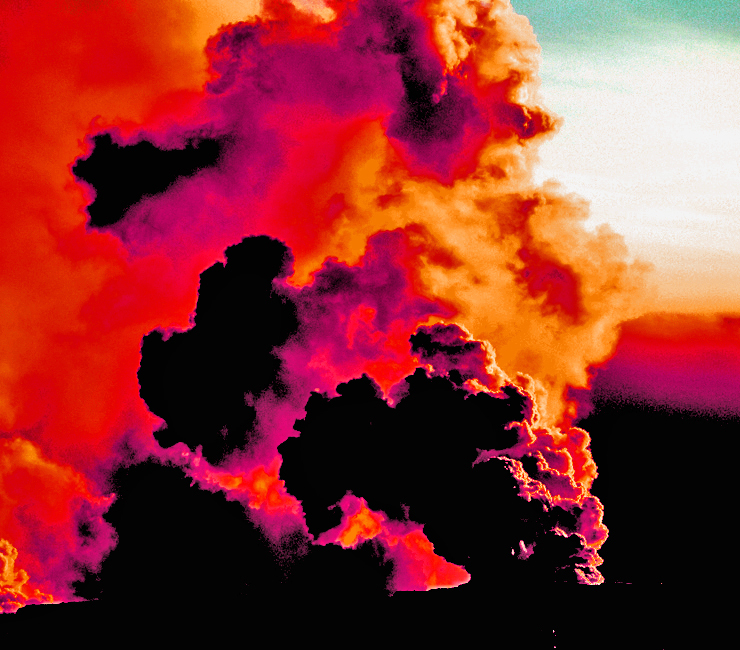 The first mode involves explosive volcanism at Kilauea’s summit. This activity contributed to the formation of past and present calderas in the summit area as well as having showered Ka’u with a cover of cinder and ash. The second mode is continuous effusive eruptive activity at the summit. This mode is typified by features such as the former lava lake at the summit which was present well into historic times, and events such as voluminous outpouring of lava from several summit vents. This mode tends to fill-in summit calderas and produce a landscape of broad, coalescing shields atop the various vents. The third mode of eruption is the continuous flank eruption, as seen today on the East Rift at vents such as Pu’u O’o and Kupaianaha. 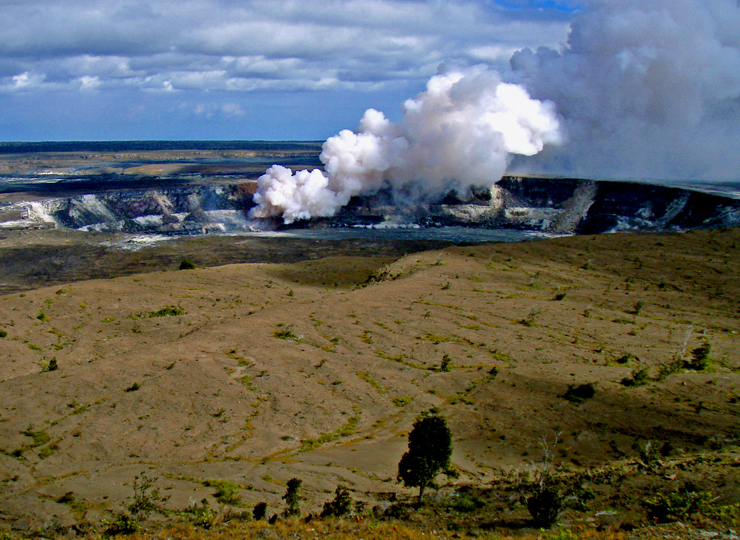 These modes are derived from observation of the volcano’s activity only during modern times, and almost certainly Kilauea’s behavior over geologic time must be much more complex. 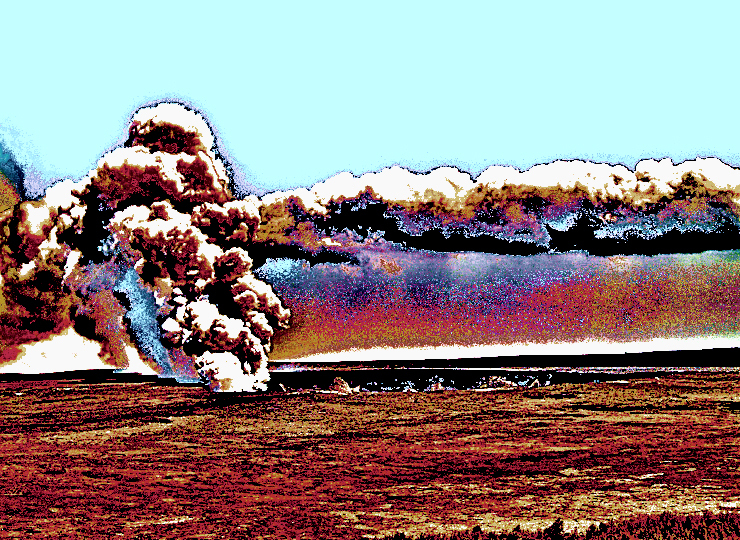 Rather than a view of the evolution of Kilauea Volcano, these modes may serve more as template through which to view what the volcano is capable of doing. It has been observed that periods of volcanic quiescence, or of small eruptions which shift location from summit to flank, may herald a shift in these eruptive modes. Further, it has been suggested based on recent observations that large, south-flank earthquakes initiating magma intrusion can greatly alter eruptive modes. So, now that we understand a little of the mystery and complexity of Kilauea Volcano, where is the best place to see it from? 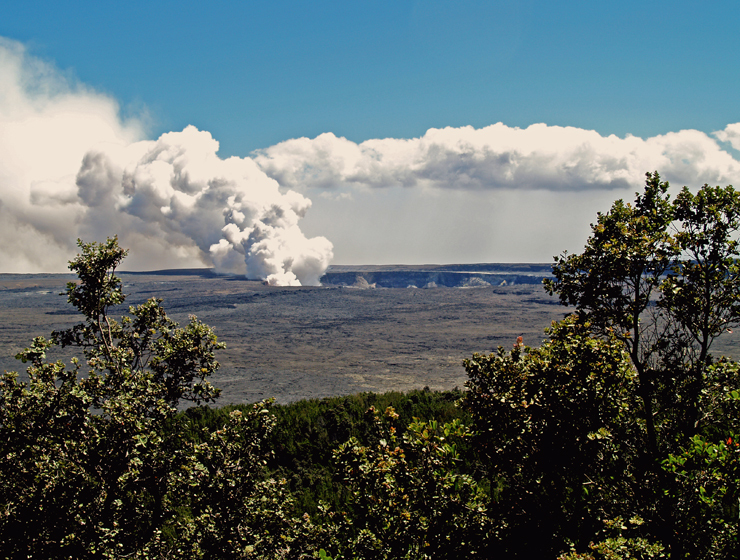 For starters, one cannot beat the view off the back porch of Volcano House in Hawaii Volcanoes National Park, which encompasses much of Kilauea Caldera and Halema’uma’u Crater. Although currently closed between Jagger Museum and the intersection with Chain of Craters Road because of the ongoing eruption in Halema’uma’u Crater, the portion of Crater Rim Drive which is open provides a unique view of the volcano in a scenic loop around the entire summit region. 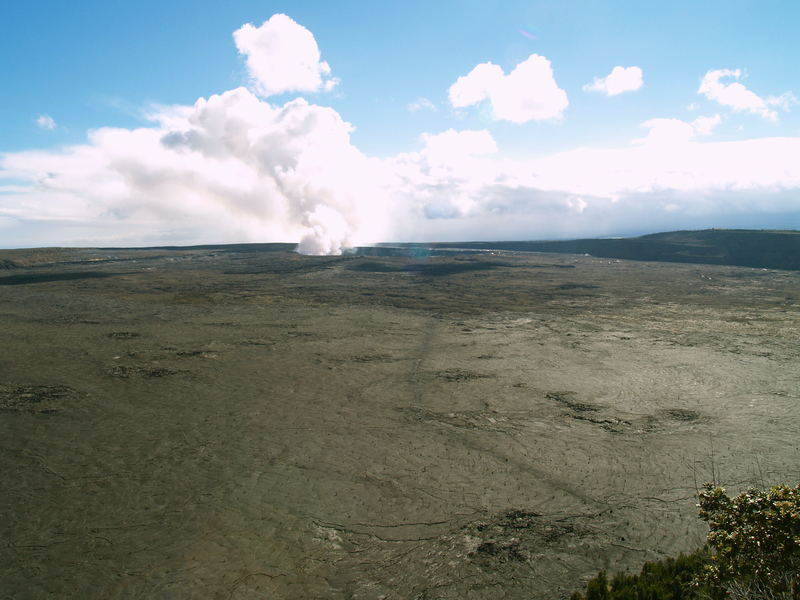 Of particular interest are the stops at Steaming Bluff, Jagger Museum, Halema’uma’u Crater (closed), Southwest Rift Zone (closed), Keanakako’i Crater (closed), and Kilauea Iki Crater Overlook. Driving across the summit dome and down to the slump-block cliffs on Hilina Pali Road takes you on a fabulous backcountry exploration from a nether-world of volcanic destruction and to lush, tropical dryland forest and savanna. 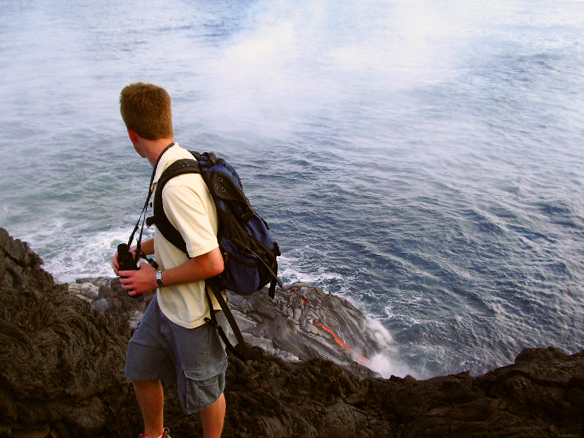 Hikes along Devastation Trail, through Kilauea Iki Crater and out to the caldera overlook at Waldron Ledge give fabulous insight to Kilauea Volcano and are particularly beautiful as well as fascinating, and fairly easy for those in reasonable physical condition. 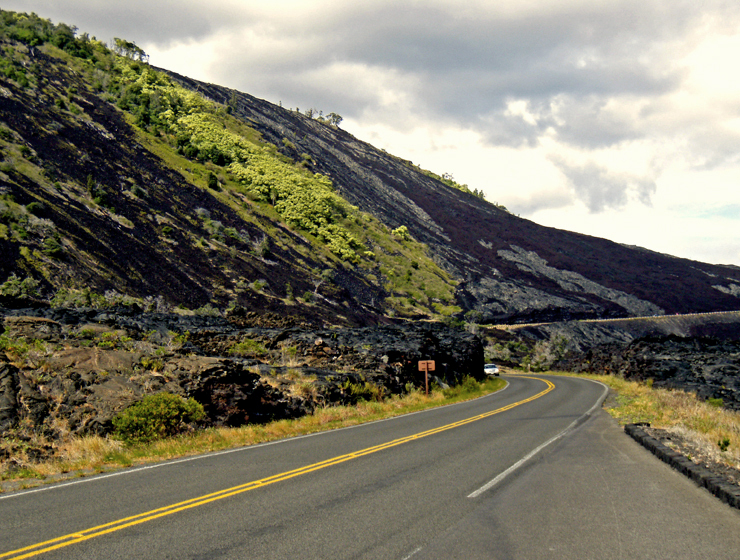 Aside from the summit region, the Chain of Craters Road travels through the most interesting geography of Kilauea, including lava flows from numerous recent eruptions. 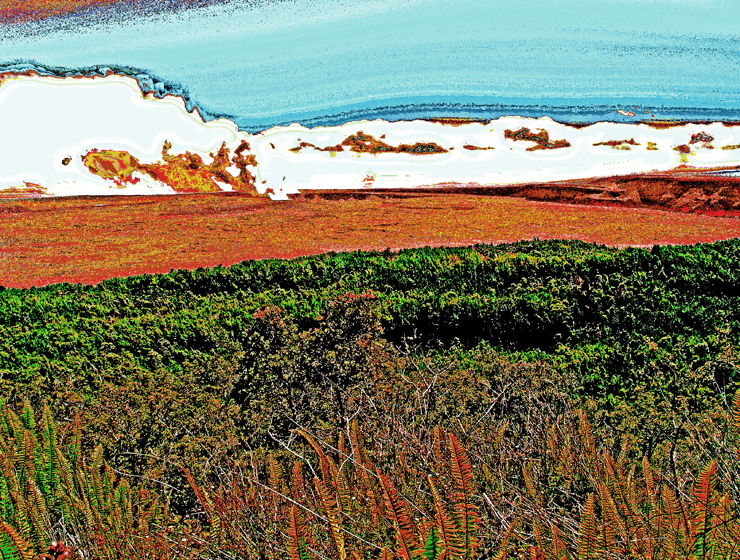 Although everywhere fascinating, stops at Pauahi Crater, Mauna Ulu and Muliwai O Pele are almost mandatory. As mentioned earlier, this drive gives stark perspective on the slump blocks and the slippage of Kilauea’s south flank toward the sea. 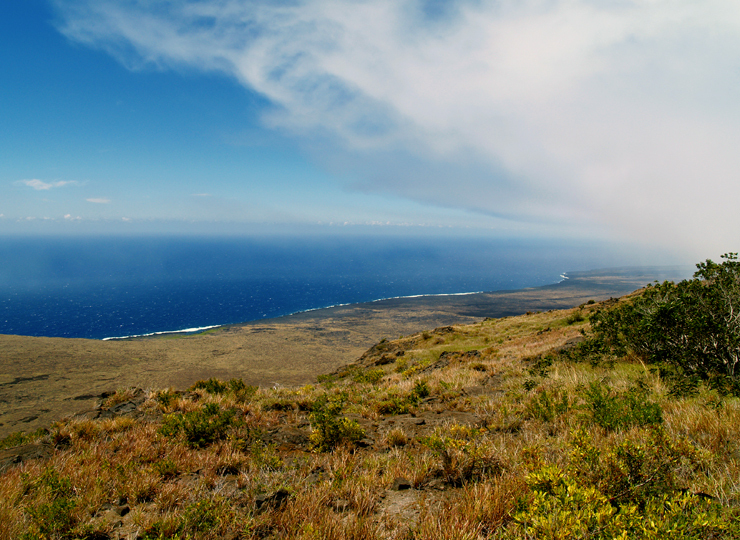 Stops at Kealakomo Overlook, Halona Kahakai, Alanui Kahiko and Holei Pali illustrate the vast nature of the slow creep of Kilauea’s southern flank down-slope. A stop to see the amazing, ancient petroglyphs at Pu’u Loa Petroglyph Field provides a moving, human connection to the peoples of the past, the awe and respect they had for this Goddess and her mountain home. The end of Chain of Craters Road gives way to a playground of geological landscapes, booming sea cliffs and ancient villages, as well as providing the jumping-off point for hikes to see the flowing lava, when it is flowing within the Park boundaries. A complete guide to exploring Hawaii Volcanoes National Park can be found here; you should plan to spend the better part of a full day in the park—unless you’ve been here before, it will be the most interesting place you’ve ever been to yet. Viewing the flowing lava, the spectacle of the earth remaking herself, is one of the most moving, soul-filling, surprisingly emotional experiences you can have. 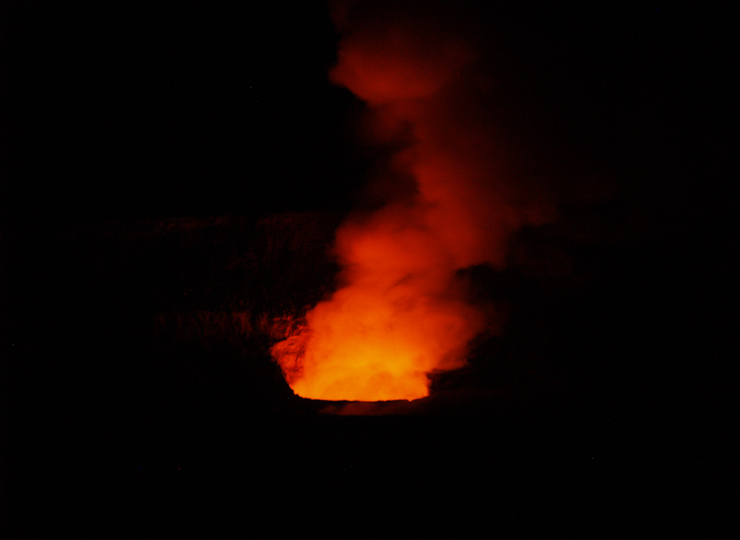 The current eruption in Halema’uma’u Crater, although it hasn’t yet produced any lava flows, is best viewed from the Jagger Museum; at times of peak activity, it is most spectacular when viewed after dark. Guides to Lava Viewing in the Park and at the County of Hawaii Lava Viewing platform east in Puna at Waikupanaha can be found here and here respectively. 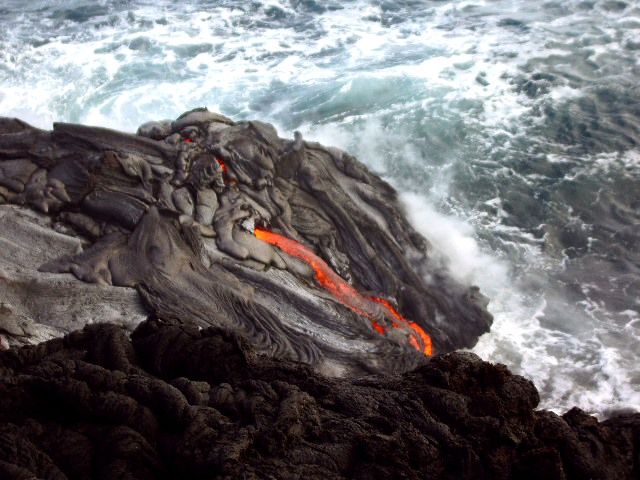 A general outline of the volcanoes of Hawaii Island is presented here, a brief discussion on the differences between a’a and pahoehoe lavas can be found here, and an overview geologic history of the Hawaiian Islands can be found here. Perhaps no other volcano in the world, certainly no active volcano, is so easy to explore, to touch, to experience. 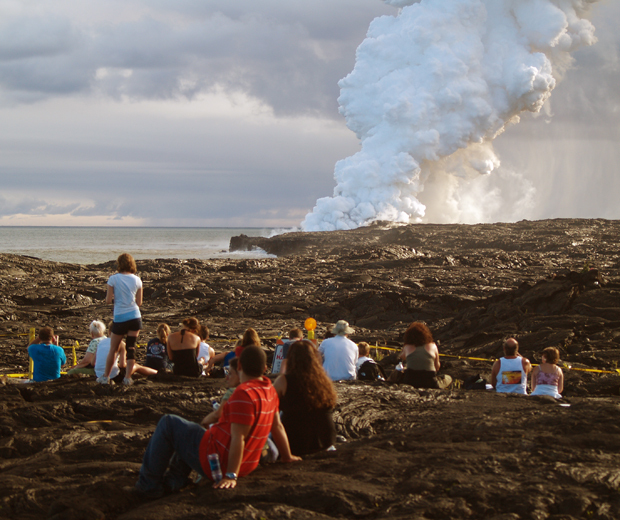 If you come to see Kilauea, home of the Goddess Pele, be sure to give yourself a lot of time—you’ll be more captivated than you expect; certainly you’ve never experienced anything like this before. 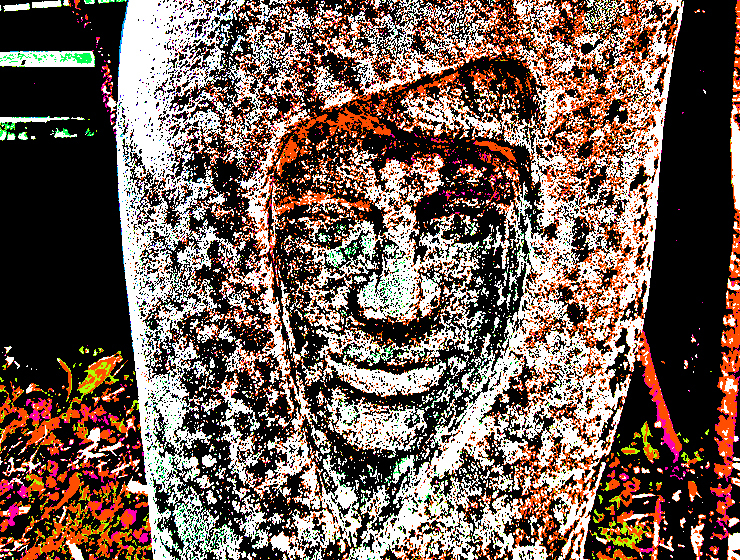 Come, explore, enjoy, stand at her door and breath the breath of the Fire Goddess. 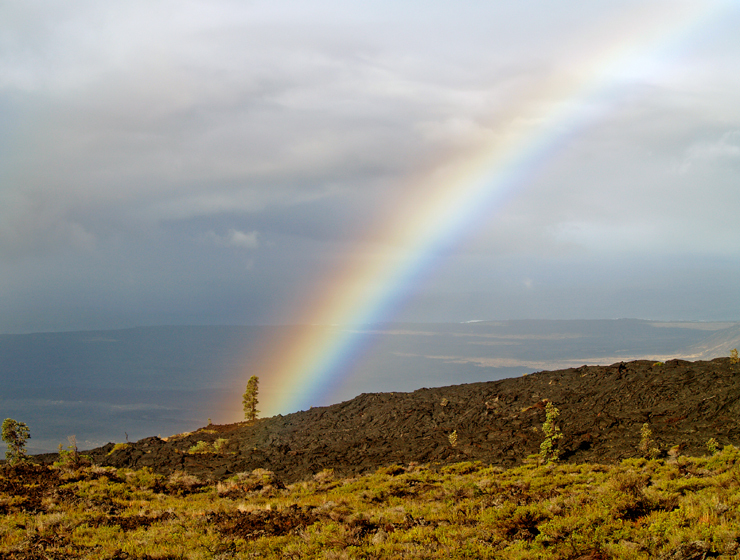 Hawai’i Volcanoes National Park is a magical, spiritual, wondrous, strange and beautiful place. The Park comprises a land of great contrasts and contradictions ranging from dry as dust desert to teeming tropical jungle; from frigid sub-arctic wasteland to steaming black sand beaches and rivers of flowing lava. Easily the most captivating part of any trip to The Big Island, most people don’t think to schedule enough time to explore this amazing place and wind-up hurrying through, wishing they’d saved more time to see all the wonders of the goddess’s home. Established in 1916, the Park is almost half a million acres in area, about the size of O’ahu, but lots more interesting. 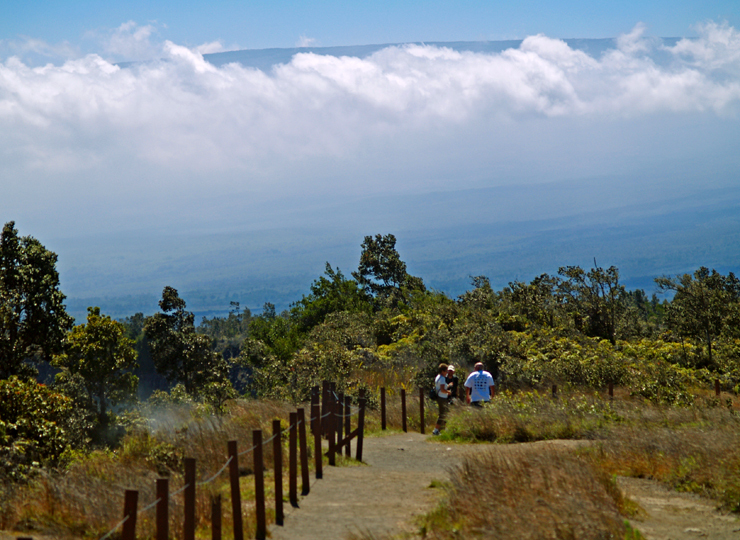 The star attractions in the Park are a pair of active volcanoes; Mauna Loa is the largest mountain on earth and Kilauea is most active volcano on earth. 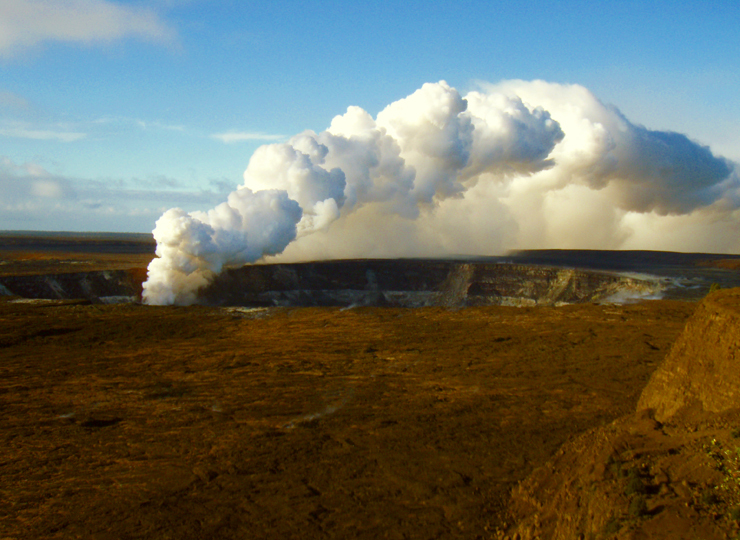 However, there are numerous other wonders from lava tubes to crawl down, black sand beaches with sea turtles to watch, mysterious petroglyph fields to explore, tropical jungles to hike through, endangered bird species to find, happy-face spiders to amuse and an otherworldly volcanic landscape so fresh it’s still steaming. In places it’s so fresh it’s still flowing. At Hawaii Volcanoes National Park you can tour by car, take a commercial bus tour, explore by bike, hike the most amazing and finest trails on the island over cinder cones, calderas and deserts on 140 miles of spectacularly diverse trails, wander the smoking lava fields, stand in the rain in a kipuka fern forest or climb to icy heights of a volcanic summit. You can even sit back, relax and just enjoy the view or you can peruse the best collection of art for sale in the entire state at the world-renowned Volcano Art Center. 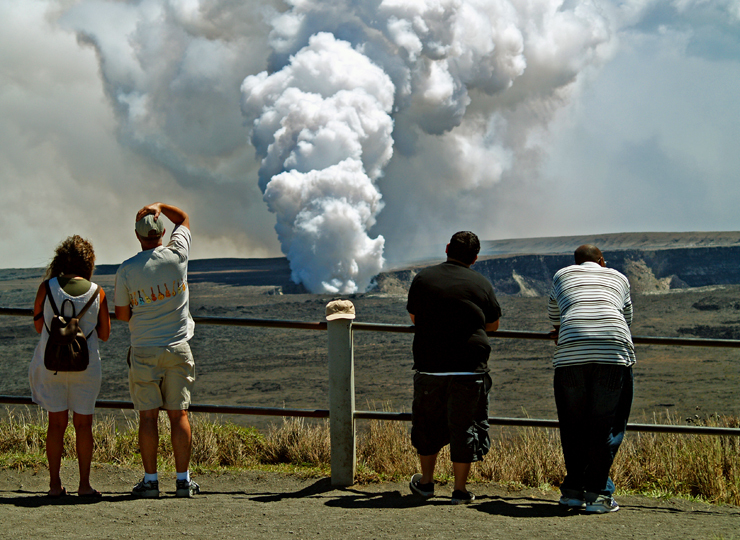 Seeing the eruptions, the flowing lava, the mystery and magic of the Earth remaking herself before your very eyes, is the first thing most visitor’s think about when they contemplate visiting Hawaii Volcanoes National Park. Although the Park is about much more than just the current eruptions, seeing the flowing lava is certainly the most dramatic and memorable part of any visit. Currently, Kilauea Volcano is undergoing two eruptions, one in Halema’uma’u Crater in the Kilauea Caldera and one along its East Rift. 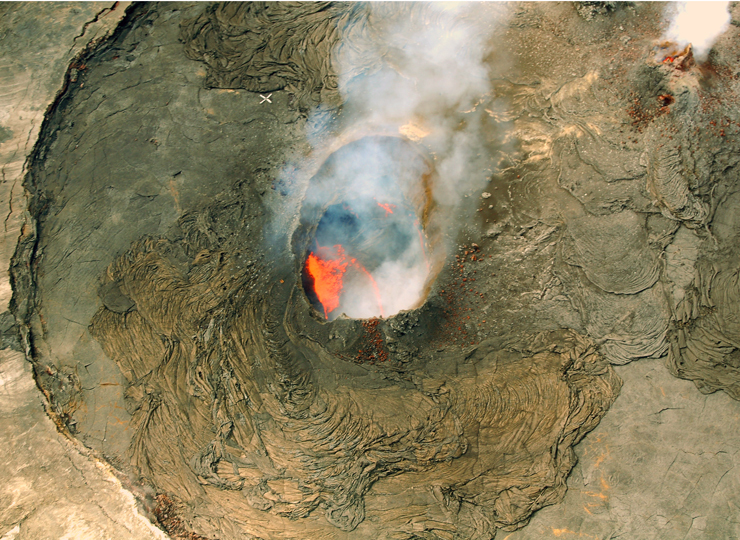 The Halema’uma’u eruption involves the formation of a lava lake within the crater itself, although the lake is covered by a roof of hardened rock and is not visible to the visitor. The eruption has produced a lot of gas, steam and some ash that form a magnificent eruption cloud over the crater, best viewed from the Jagger museum. 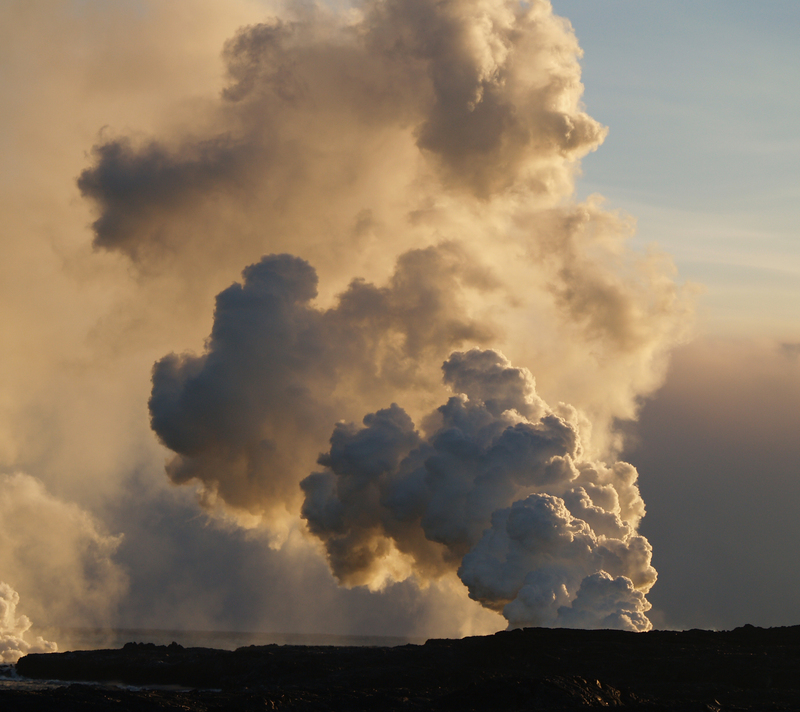 The eruption cloud has a magnificent orange glow at night, from the molten rock below, which is best seen after dark from Jagger Museum. 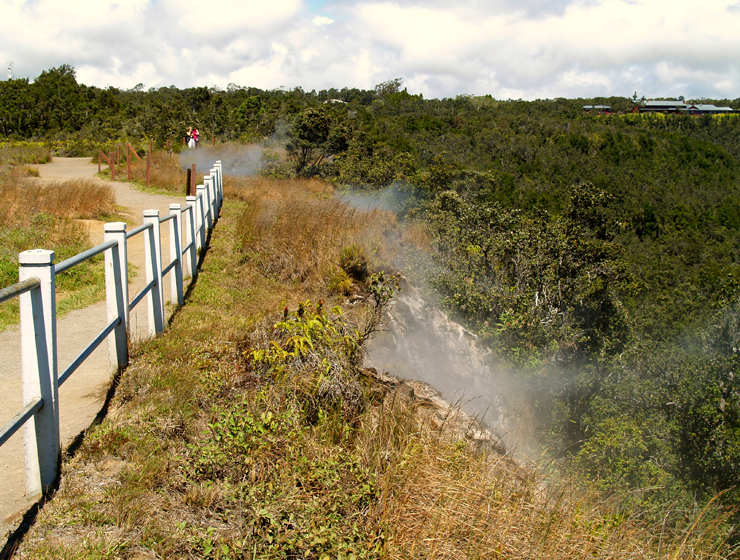 Due to toxic gas emissions and the danger from the eruption itself, Crater Rim Drive has been closed around the south and east sections of Kilauea Caldera from Jagger Museum to the junction with Chain of Craters Road. 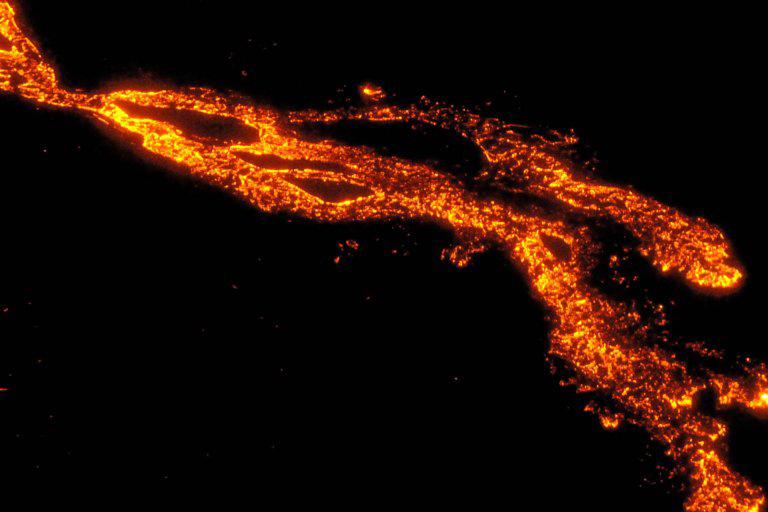 The east rift eruption is the one which produces the magnificent lava streams and fantastic explosions where the lava enters the ocean. 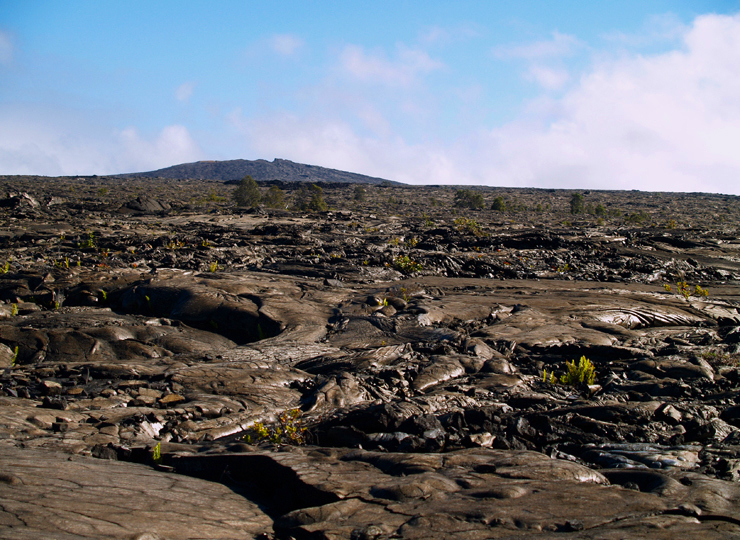 Over the years, the lava flows wander back and forth across a lava plain of about nine miles breadth. 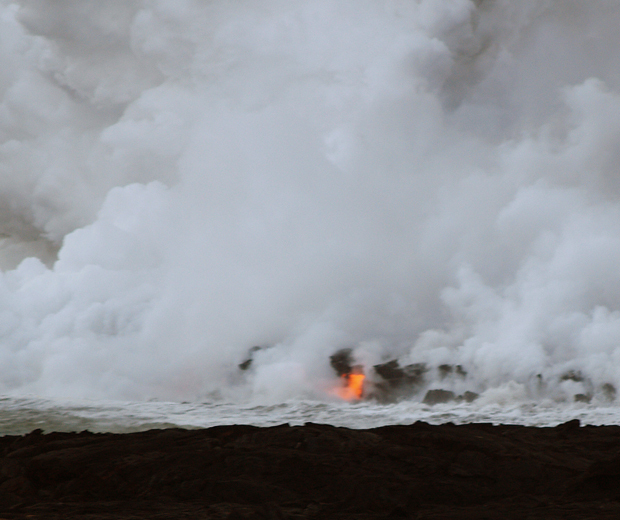 Where lava is currently flowing makes a difference in how you approach it and where you see it; to get details on current eruptive and flow activity, you may call the National Park Eruption Hotline at 808.985.6000 or the County of Hawaii Eruption Information hotline at 808.961.8093. 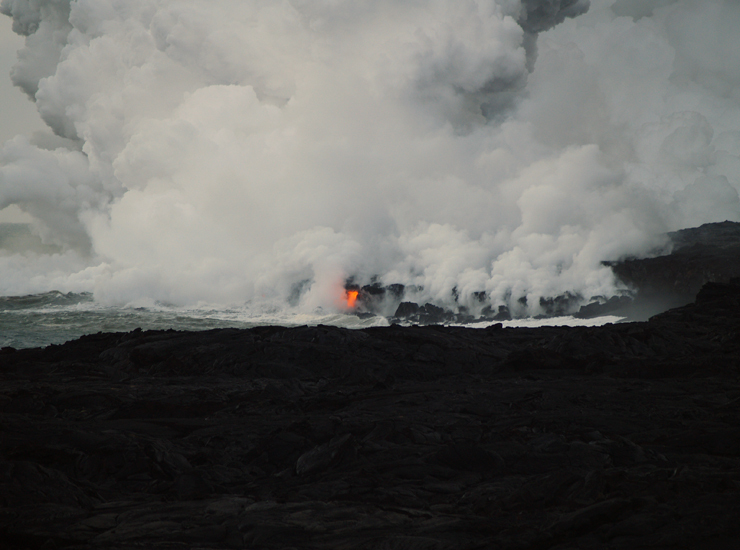 When lava flows enter the sea within the Park, it is possible to hike directly to them and observe them. 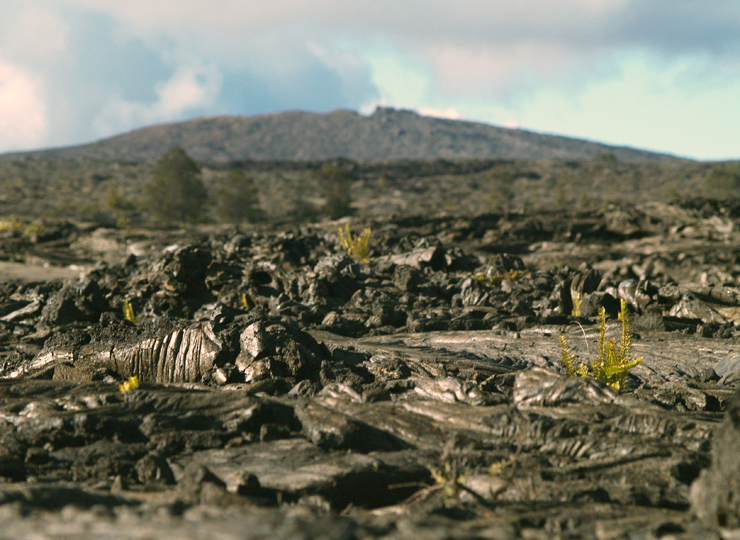 Detailed information on seeing the lava flows from within the park can be found here. When lava is flowing on County of Hawaii land north and east of the Park, you must drive to Waikupanaha, outside Kalapana, and see it from the Hawaii County Lava Viewing Area; detailed information about seeing the lava at this location is here. Open 24 hours a day, 365 days a year, the Park Entrance is above 4000 feet altitude and frequently chilly and wet; bring warm clothes and a rain jacket. 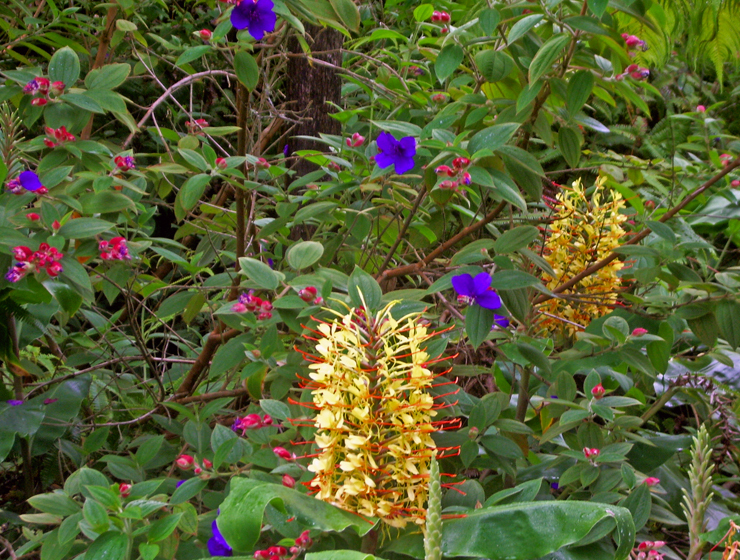 Remember this if you’re tired of roasting on the beach, a day in the cool mist of the mountain fern forests may be just the thing to put the zing back in your Hawai’i vacation! If you’ve never been here before, you’ve certainly never seen anything like this…and you may never get another chance. Be sure to allow plenty of time to see this fabulous, beautiful, mysterious place. A good introduction to the geologic history of the Hawaii Islands in general can be found here, and the volcanoes of Hawaii Island, in particular, can be found here. 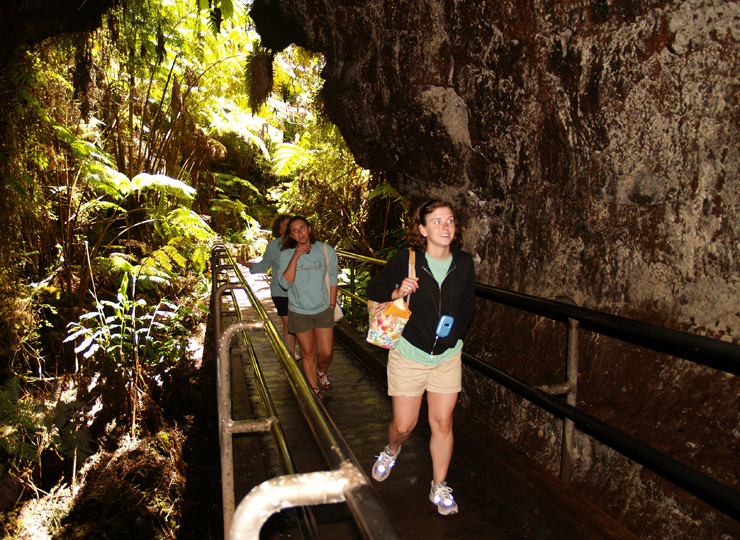 General Information: Hawaii Volcanoes National Park is open 24 hours a day, 365 days a year. During daylight hours, an access fee is charged. The Visitor Center has a 24-hour information line at 808.985.7017 and there is a 24-hour eruption hotline at 808.985.6000. Within the Park tune to A.M. radio 530 for continuous information broadcast. Within the Park, two main roads serve as scenic drives showcasing the wide variety of climates, vegetation, landforms and other wonders; Crater Rim Drive and Chain of Craters Road. 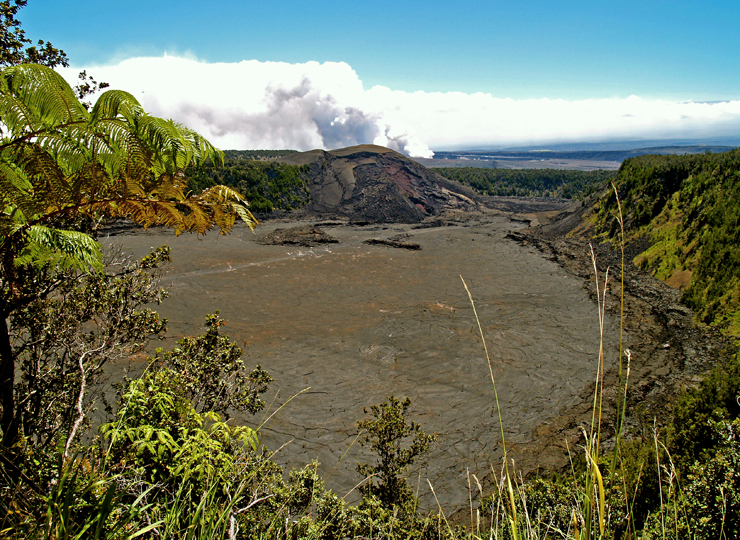 Crater Rim Drive circumnavigates Kilauea Caldera (as well as Halema’uma’u Crater, home of the Goddess Pele) in 11 intriguing miles. Although the drive can be made in less than 40 minutes, one is urged to schedule at least three hours to adequately cover the wonders and marvels along its path. Individual sites along Crater Rim Drive are described in detail elsewhere, but this incredible road, which serves as a great introduction to the Park, runs through and connects the Volcano House, the newly remodeled Kilauea Visitor’s Center, the Volcano Art Center, Sulfur Banks and Steaming Bluff, the informative and well-done Jagger Museum and Hawaii Volcano Observatory, numerous caldera overlook points including overlooks of Halema’uma’u Crater, Devastation Trail, Pu’u Pua’i, Kilauea Iki Crater which has perhaps the finest hiking trail in the Park trail and the justly famous Thurston Lava Tube. The other scenic drive, Chain of Craters Road, takes off from Crater Rim Drive near the Devastation Trail and swoops down the volcano over 4000 feet to the ocean. 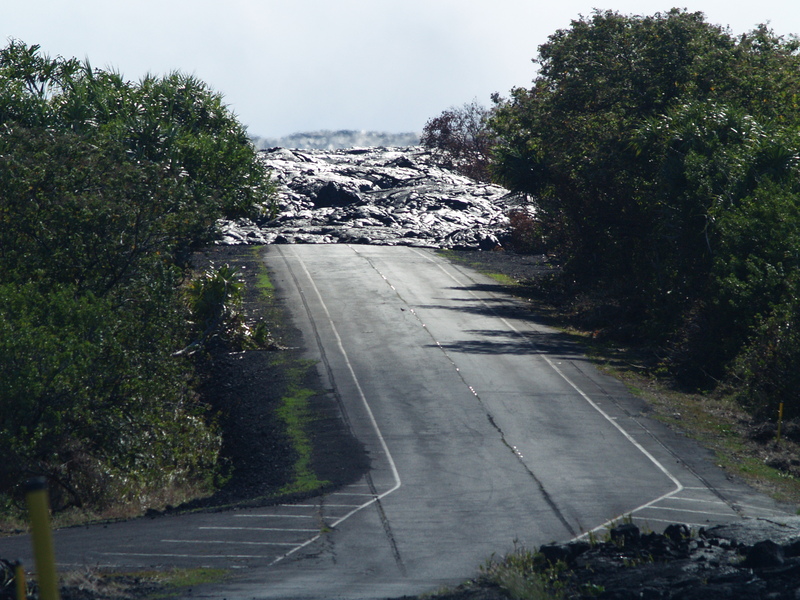 In about twenty miles it dead-ends where lava flowed over the road in 2004. The road roughly parallels the active East Rift Zone (hence all those craters) and winds steeply down the Holei Pali through alternating basalt desert and thick ohi’a, fern and orchid forests, giving staggering vistas of the coastline below. Along this road, in addition to numerous craters and pits, is the turn-off to Hilina Pali Road, a five mile drive to one of the most spectacular views in the State of Hawaii. 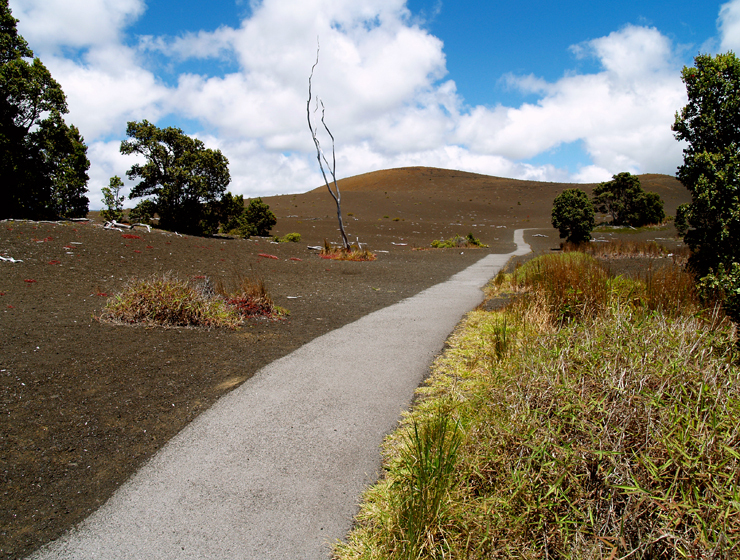 Mauna Ulu, which last erupted in 1976, is along this road and the hike up this cone is one of the most amazing, and awe inspiring, anywhere. Kealakomo Overlook has incredible views out over the lava plain and coast below the Holei Pali and, after descending the Pali in long swooping curves, the road passes the parking area for Pu’u Loa Petroglyph field, the greatest concentration of petroglyphs in Polynesia. 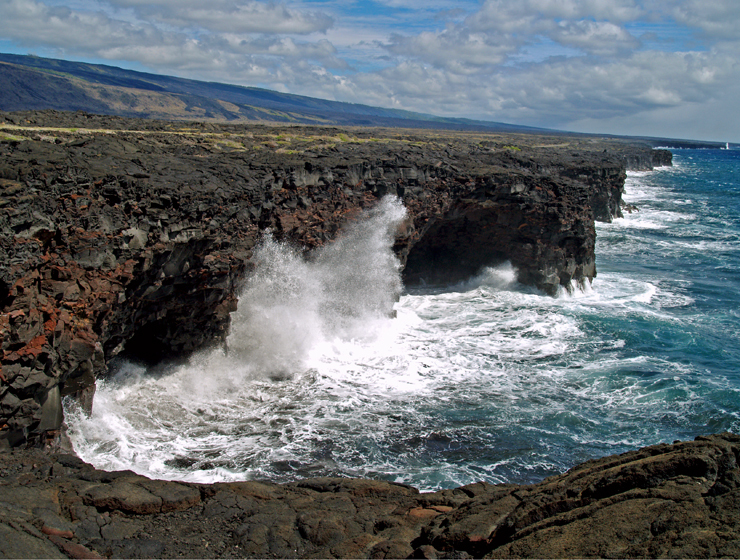 The road then heads along the sea cliffs, with waves booming and billowing over them, to Holei Sea Arch and its dead end in the recent lava flow. 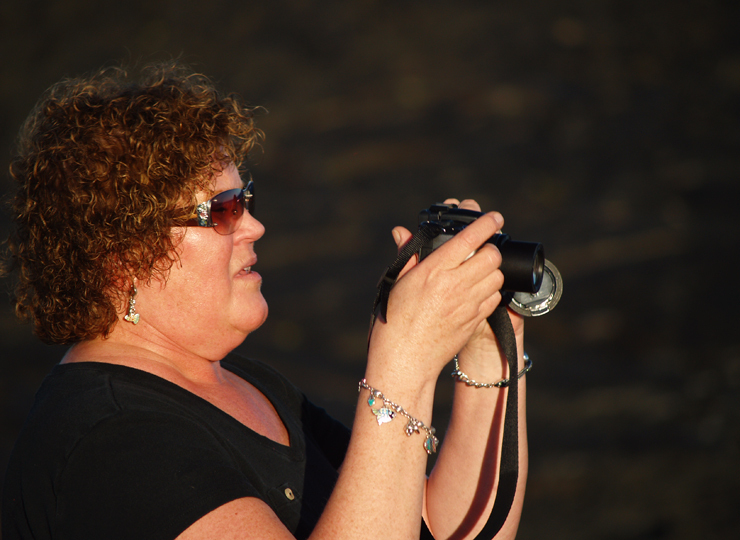 At the end of Chain of Craters Road are other activities that many visors miss, such as mountain biking, hiking, fabulous bird watching among other; more information can be found here. Even when several miles away, from the end of Chain of Craters Road the lava flows look invitingly close and one is tempted to dash out and look at this wonder of nature…but the march is over rough terrain, dry and hot and likely much farther than it looks. 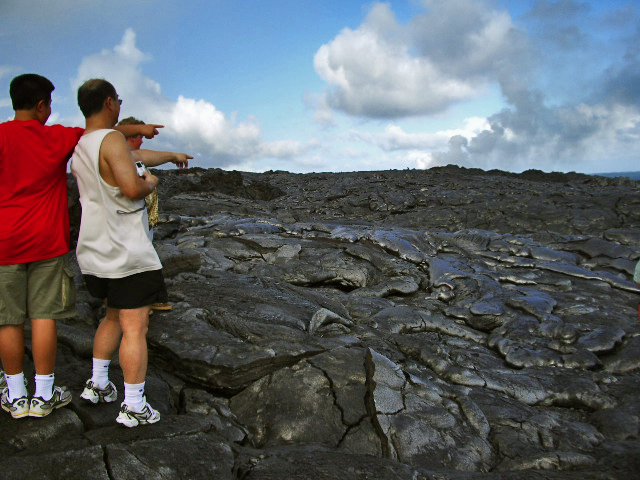 Before venturing out to the lava flows, absolutely review the information on lava viewing here…it may save your life; it will certainly ensure your hike is much more enjoyable. 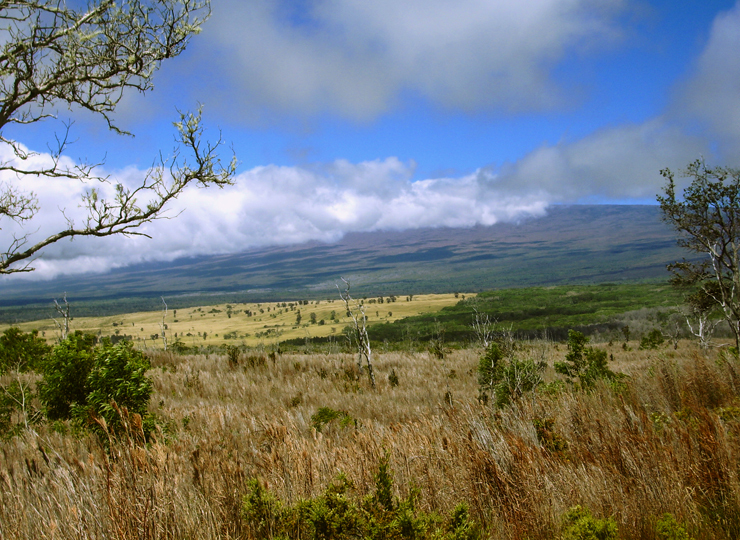 Two subsidiary roads, Mauna Loa Road and Hilina Pali Road, allow the visitor access so some of the less-traveled, fabulous backcountry of the park. West of the Main Entrance, Mauna Loa Road travels uphill through forest and grass land on the slopes of the world’s largest mountain, Mauna Loa; more information can be found here. Hilina Pali Road takes off from Chain of Craters road and penetrates nine miles into the volcanic wilderness just below the summit of Kilauea Volcano to amazing coastal views on top of the Hilina Pali. More information on Hilina Pali Road can be found here. Remember that the only gas available near the Park is in the village of Volcano immediately east of the Park’s main entrance. It is wise to fill-up before entering the Park. No matter what your plans may be, you are likely to spend more time and use more gas in the Park than you had originally intended. Yes, it’s that good. Fees: Access fees for Hawaii Volcanoes National Park for hikers, bikers and motorcyclists are $5.00; vehicles are charged $10.00. This charge entitles the payer to 5 days unlimited access to the Park. One can also buy a Hawaii National Park Pass for $20.00 good for one year at all National Park sites on the Big Island and Maui. For $50.00 one can buy a Golden Eagle National Park Pass, good for one year at any National Park in the country. U.S. citizens over 62 years of age can purchase a Golden Age Passport for $10.00 that entitles them to free access to all National Parks for life. Disabled U.S. citizens may obtain a free, lifetime Golden Access Pass good at all National Parks in the country. Parking: parking is clearly marked in various areas of interest; do not park along the side of the road, on trails or other unmarked places. 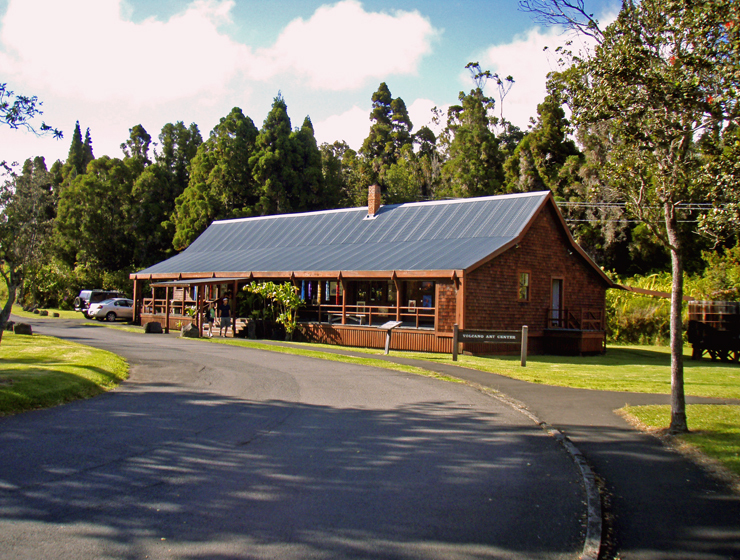 Public toilets: facilities exist at the Visitor’s Center, Volcano House, Volcano Art Center, Jagger Museum, Thurston Lava Tube and Namakani Paio Campground. Water is generally available to tourists at only these locations as well. Pit toilets (but no water) are available at Kipuka Puaulu on Mauna Loa Road, Kilauea Overlook, Mauna Ulu, Hilina Pali Overlook and Kulanaokuaiki Campground on the Hilina Pali Road and at the end of Chain of Craters Road. In the backcountry, water is available in catchment basins at some of the shelters and huts, but you should check with Backcountry Rangers on availability first. There are no lakes or streams in the National Park whatsoever. In addition to weather and temperature that is unpredictable, changeable and baffling, remember our intense tropical sunlight is made only more intense at altitude. 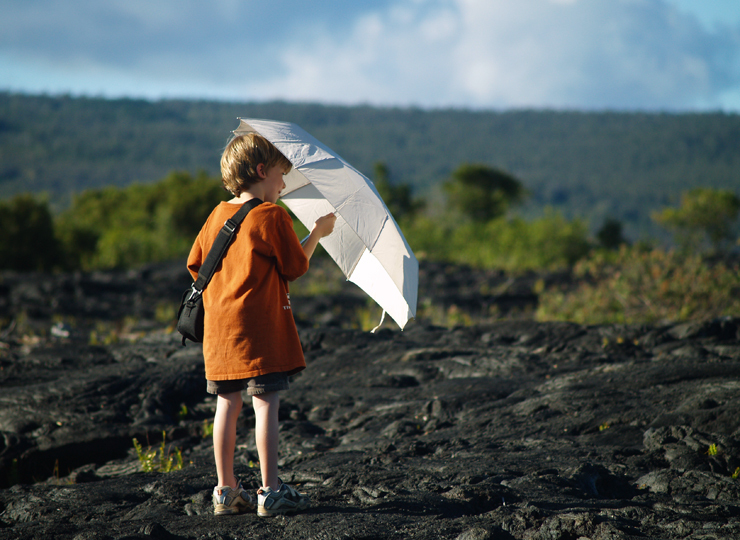 Sunscreen, sunglasses and a sun hat are mandatory…in fact, it is so important we have written separate articles on the use of sunscreen in Hawaii and on sunglasses in Hawaii. Too many visitors ignore warning about our fierce tropical sun and wind-up with a vacation-ruining sunburn or headaches and eye-burn from the intense light; please review that information. Disabled Access: Special attention has been paid to access by disabled persons to many of the less easily seen wonders in the Park at all levels. Handrails and ropes line trails to the Steam Vents and Halema’uma’u trails. Others, such as Devastation Trail and Crater Rim Trail along Waldron Ledge and some of the shorter trails are wheelchair accessible. 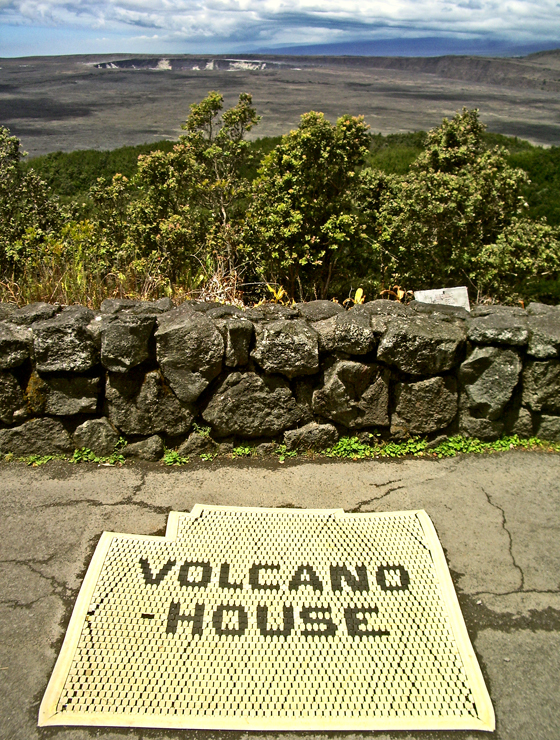 The Visitor Center, Jagger Museum, Volcano House and Volcano Art Center are all fully handicap accessible. 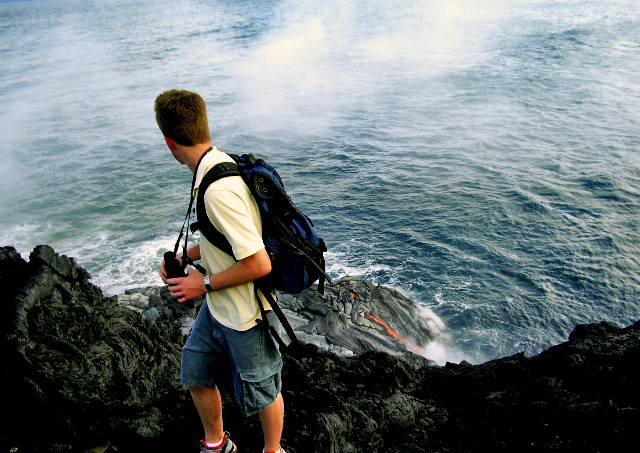 Unfortunately, the flowing lava can only be seen by a long hike or from the air. Camping: Camping cabins are available for a nominal fee at Namakani Paio Campground just west of the Park Entrance. 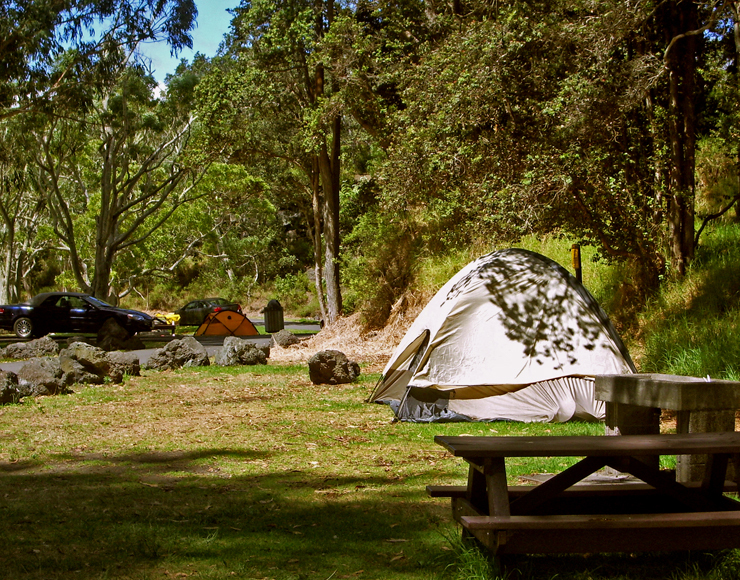 Free tent camping is available at both there and at Kulanaokuaiki Campground on Hilina Pali Road inside the Park; however, no water and only pit toilets are available at the latter. 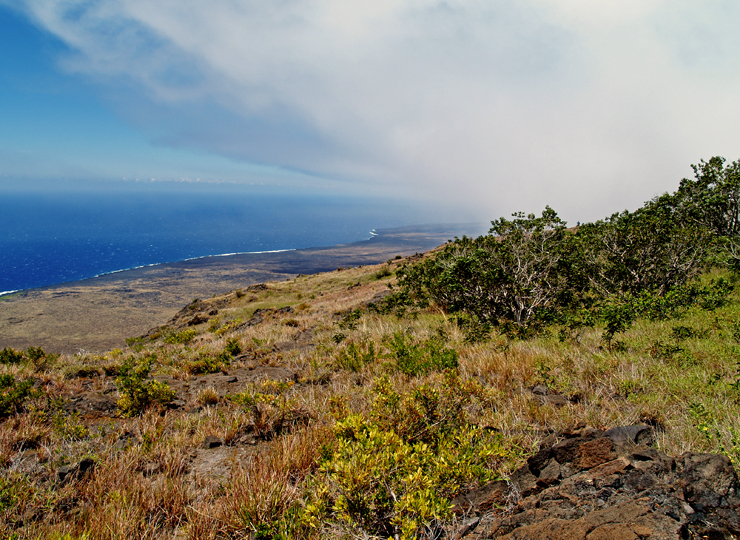 There are numerous hike-in campgrounds requiring permits along the many trails in the Park; for locations, permits, availability and regulations, contact the Backcountry Office at 808.985.6017. 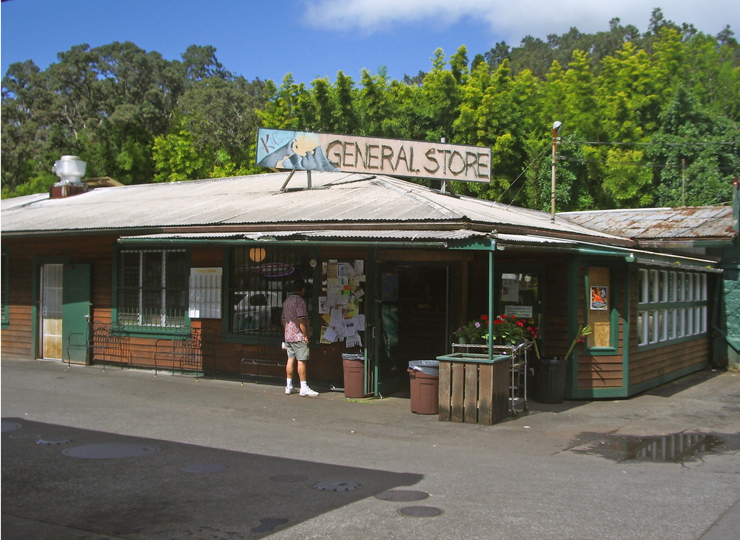 The grand tradition of hosteling at the edge of Kilauea Volcano began with construction of the first Volcano House in 1846; as such, Volcano House is Hawai’i’s oldest continuously operated hotel. Famous Guests include Queen Liliuokalani, Samuel Clemens, Theodore Roosevelt and Elvis Presley. Since Polynesians first arrived in Hawai’i, temporary grass shacks had been constructed on the lip of Kilauea Crater to shelter kahuna and ali’i who went there to give praise and worship to Madame Pele. 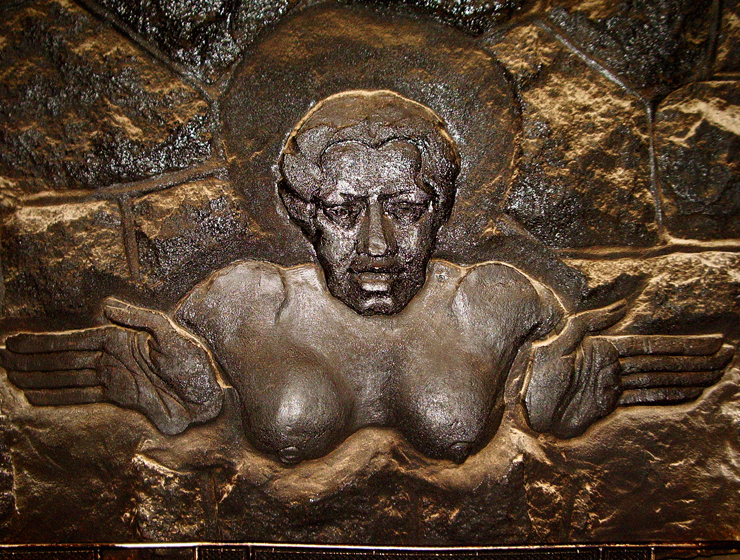 Chiefess Kapiolani, a converted Christian, had a grass hut constructed on the edge of the crater, then filled with a molten lava lake, in 1826 from which she and her retinue held ceremonies to denounce the goddess. In 1877 the first fully wooden Volcano House was built, which featured 6 rooms and a large parlor with a fireplace. This building is now being used as the Volcano Art Center and was moved to its present location in 1941. Although the hotel has continued to grow and change over the years, the fire in Volcano House fireplace has burned continuously for more than 130 years. In 1940 most of the hotel was destroyed in a boiler fire and Uncle George Lycurgus built the structure that stands as the current hotel in 1941 of wood and stone. 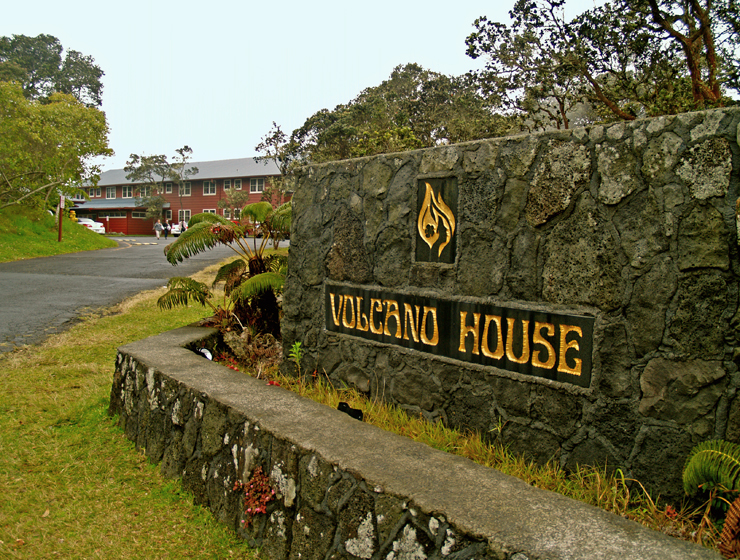 A tour of the Volcano House and small museum should include the parlor with its koa piano, paintings and welcoming fireplace, the restaurant (the only food available in the Park) and the two gift shops as well as the breath-taking view of Kilauea Crater from the back lanai of the main building. A National Park may seem an incongruous place for a world-class art gallery, but the Volcano Art Center has perhaps the best collection of art for sale in the State of Hawai’i. 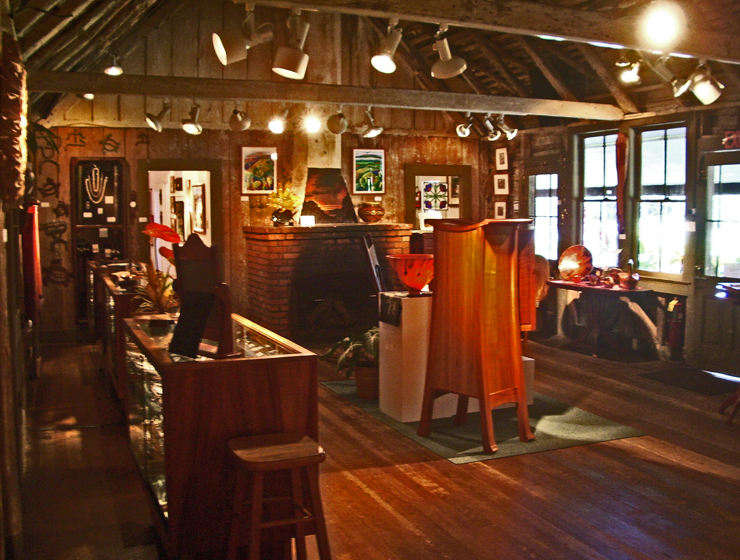 The Volcano Art Center, originally built in 1877 as the Volcano House Inn and moved to its present location in 1941, is itself an exquisite work of art, built of ohi’a and koa woods. 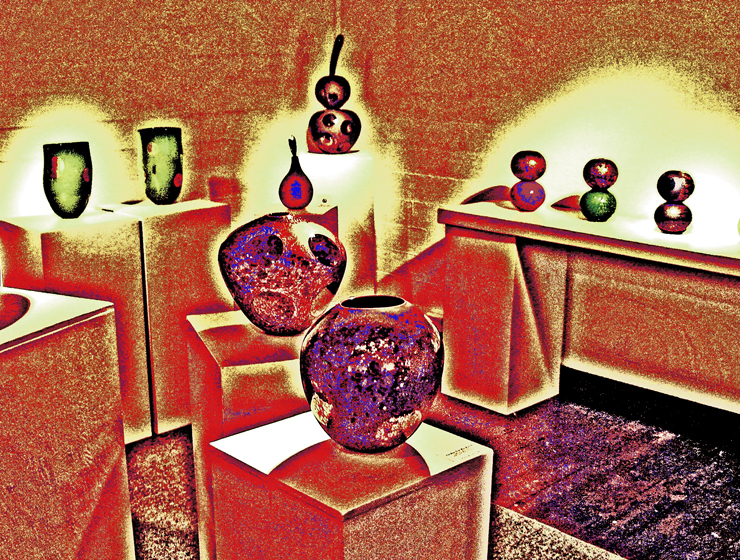 Inside you will find many one-of-a-kind works in all media: oil, pottery, metal, watercolor, glass, wood, jewelry, you name it. The Center also offers programs of dance, theater and music, as well as providing workshop and studio space to artists in residence. 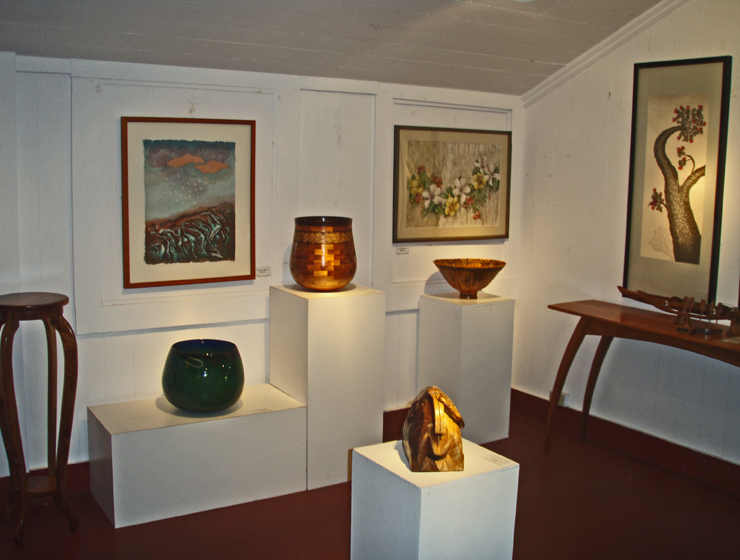 It’s a great place to come and browse, see what is going on in the fascinating world of Hawai’ian Art. >For more information on traveling to Hawaii in general and on touring the Big Island in particular, please also visit www.tourguidehawaii.com and www.tourguidehawaii.blogspot.com.